Happy Fall! I may have had my home decorated for fall for a month now, but nature finally made it official. So bring on the pumpkins! 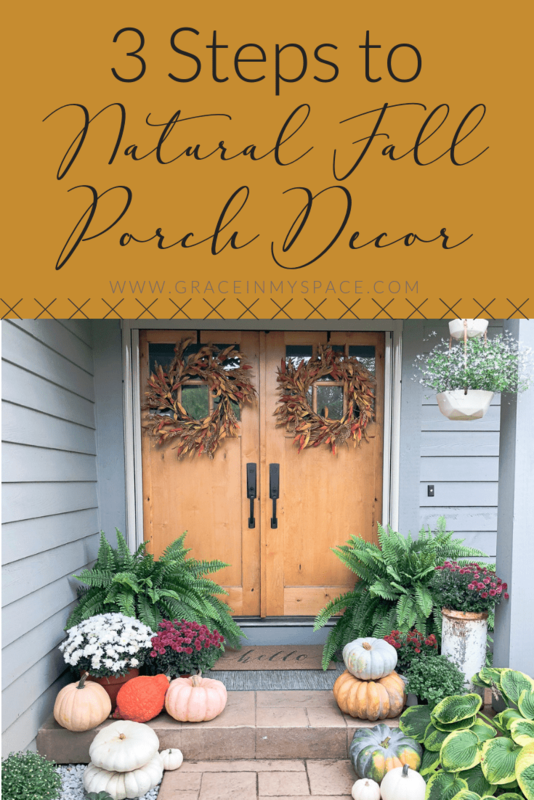 Today I’m sharing 3 steps to creating an inviting home with natural fall porch decor. The easiest way to create an inviting fall porch is to use nature. Colorful, vibrant, and simple are three important elements for my fall porch decor to embody. So I let nature take center stage when it offers all three for a fraction of the cost of store-bought decor! 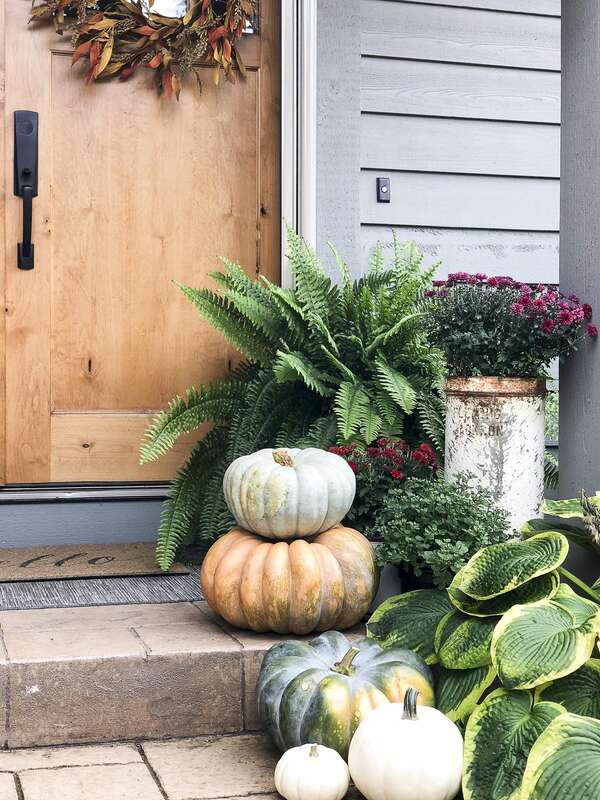 There is nothing easier than styling your fall front porch with pumpkins and mums. So let’s take a look at three simple steps to pull off this look with ease. My must-have fall porch decor is a front door wreath. Or two, in this case. There may come a time when I love our double doors bare, but for now I am loving how wreaths make them pop. 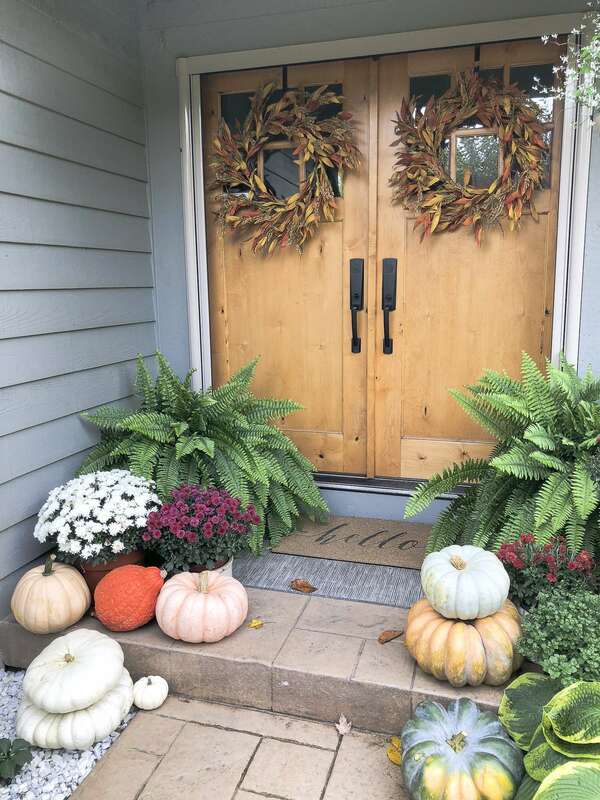 Wreaths, baskets, signs, or bouquets, are simple options to adorn your front door. I prefer the natural look of floral wreaths which can be made from your own yard or purchased. I’ve never been a sparse decorator so I’m not going to start now! Give me all the layers! Layer your welcome mats, your plants, and your pumpkins. 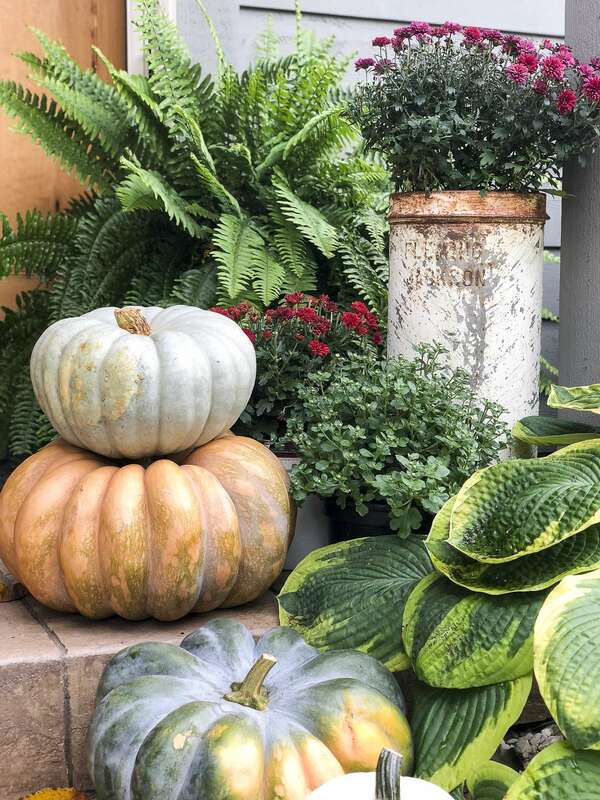 There is very little skill involved with stacking pumpkins so this is the perfect method for those who want to create a gorgeous and welcoming front porch without hours of work or heavy maintenance throughout the season. 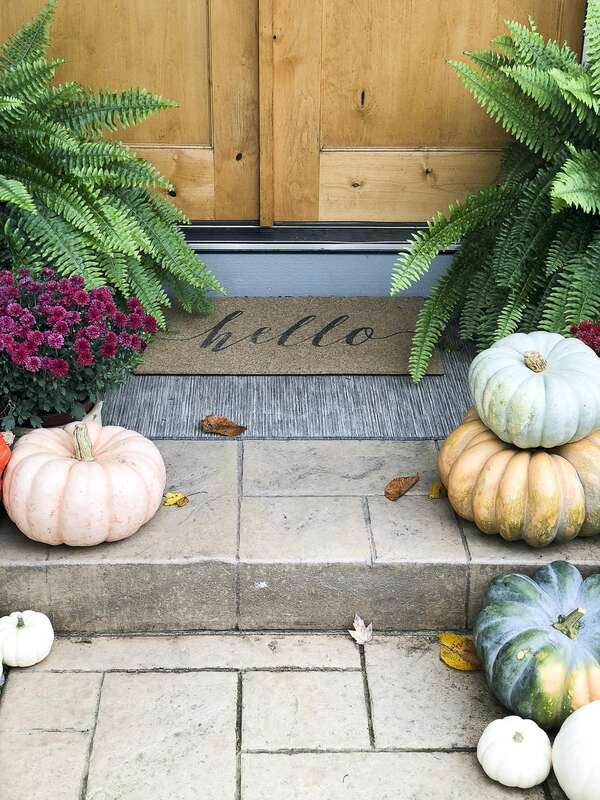 To help give shape to your fall porch decor, make sure to use repetition in your styling. Notice how I have two stacked pumpkins on the rocks (left) and two stacked pumpkins a step up on the porch (right). This repetition gives shape and consistency to the space without making it symmetrical. Also try to incorporate varying heights into your fall porch decor. I use the steps, planters, and the pumpkins themselves to vary the height so the eye is drawn across the space. Most homes have a walkway up to the front door. Treat this outdoor space as an extension of your fall porch decor. You can landscape this area for year-round enjoyment with perennials like my hostas. 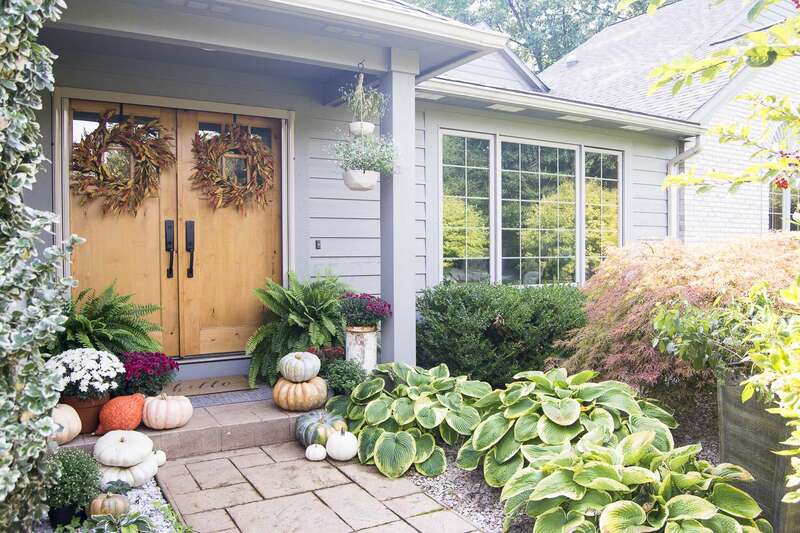 Or, you can intersperse pumpkins and mums on either side of your walkway strategically. Or, do both! 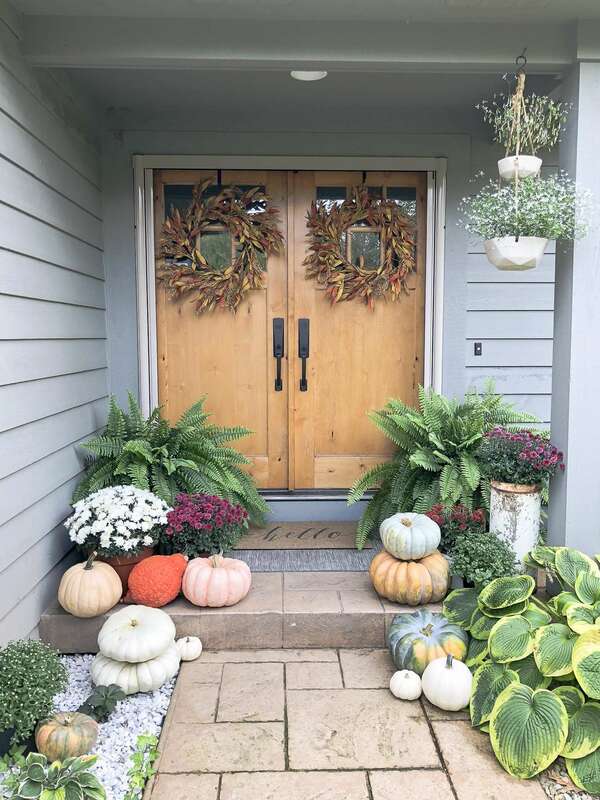 If you want low maintenance fall porch decor then this is the way to go! 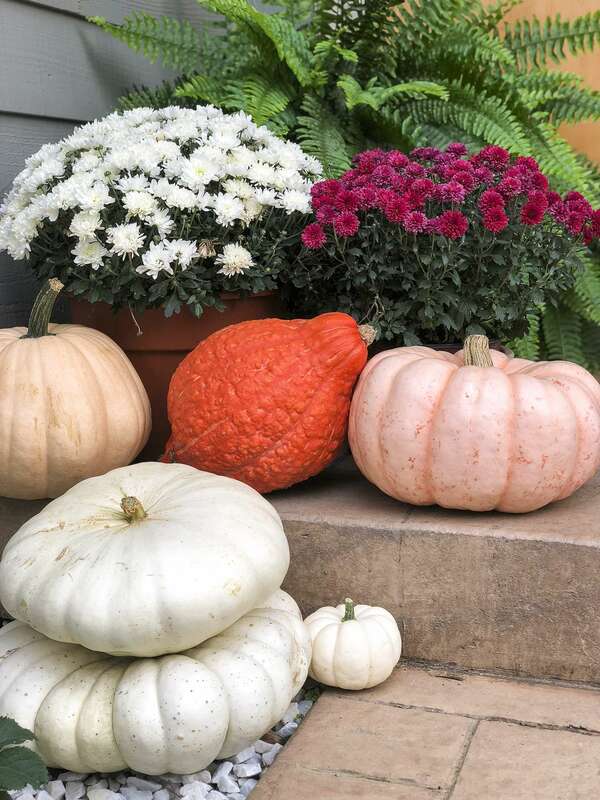 After the season is over you can either toss the pumpkins, compost them, or harvest the seeds! If frost doesn’t come too early, I try to plant my hardy mums into the ground to enjoy the following year. This type of decor leaves nothing for you to store until next year and is simply beautiful. Natural decor is an affordable way to transition the seasons and create an inviting first impression all season long. 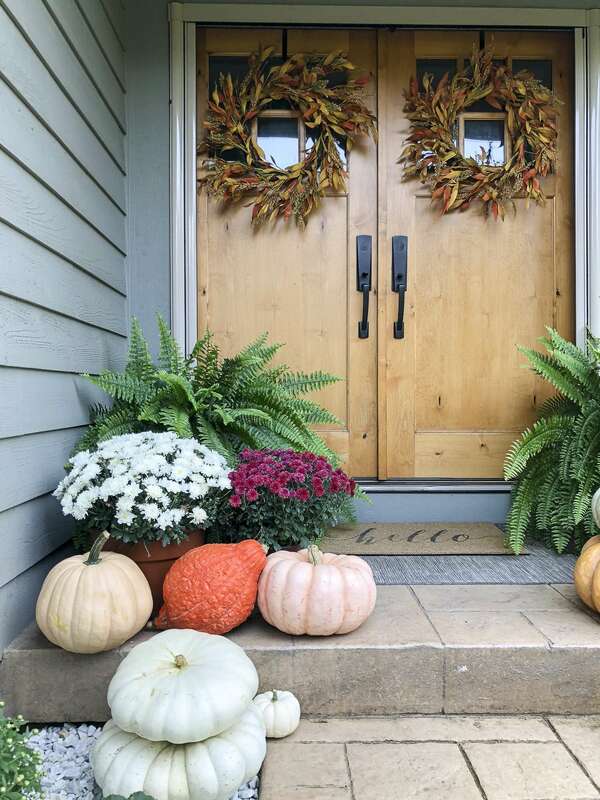 What is your go-to style for fall porch decor?